The Art Shop is actively seeking high quality original and collectible limited-edition art by well-known and quality artists for our new Estate Collection. We’d love to help you sell the treasures you can no longer use in your home. We get approached every week by people hoping to sell art from their private collections. They’ve remodeled their living room and the oil painting that belonged to their grandmother looks out of place with the new contemporary furniture. Or they’ve downsized and no longer have room for quite a number of their favorite pieces of art. While we don’t purchase art from private collectors, I went through the pros and cons of various selling options in a recent blog (http://www.artshopnc.com/blog/community/551-how-to-sell-your-art.html) – Craig’s List, consignment stores, garage sales, EBay, auction websites and The Art Shop. There are numerous advantages of selling through The Art Shop which I outlined in the blog. If you have quality art you’d like to sell, give Gallery Director Andy McAfee a call and make an appointment for him to evaluate it at no charge. Again, we are looking for originals and limited-edition pieces by well-known artists. Please note – this does not include paper lithographs by Bob Timberlake, Bill Mangum or other regional artists – there are numerous outlets to sell these. Originals by these artists would be acceptable, however. 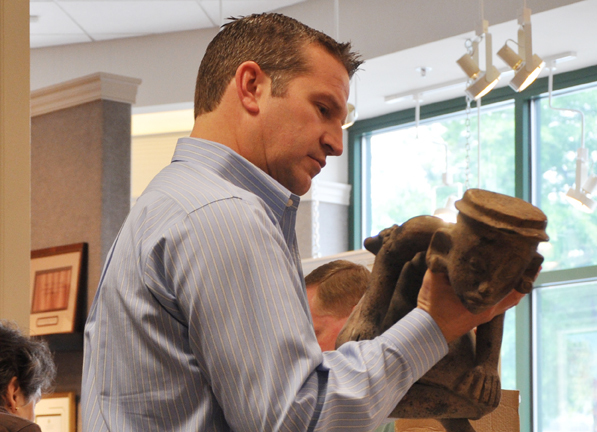 We’ve always preached KNOW WHAT YOU HAVE and TAKE CARE OF YOUR ART TO PRESERVE ITS VALUE. The art must be in excellent condition for us to be able to sell it. If there is damage, we will give you an estimate on restoration and you can decide it you’d like to have it done. Lenny and I are in the “downsizing scenario” I mentioned earlier. 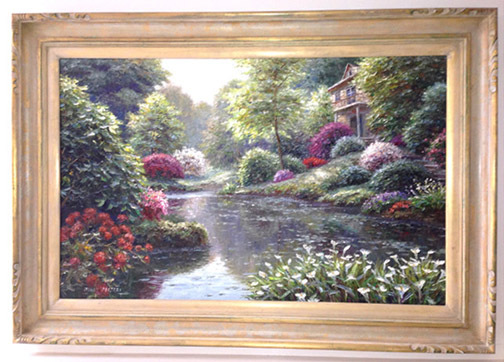 We have an original oil painting by Henry Peeters in a finished corner frame we don’t have space for in our new home. It is just one example of the type of quality art we’d like to include in our new Estate Collection. Give Andy a call at 336-855-8500 to make an appointment for him to evaluate your art. If you can’t bring it in, he makes house calls. If you have any questions, please don’t hesitate to call.